Salt is one of the most basic and ubiquitous food seasonings. Historically, salt has been an extraordinarily valuable food preservative for most cultures in the world. Natural salt contains a vast array of essential minerals and continues to be incredibly valuable for our health. Today, modern refineries have chemically altered most salt making it hazardous for human consumption. (1) In this article, you will discover the top 10 health benefits of pink salt. 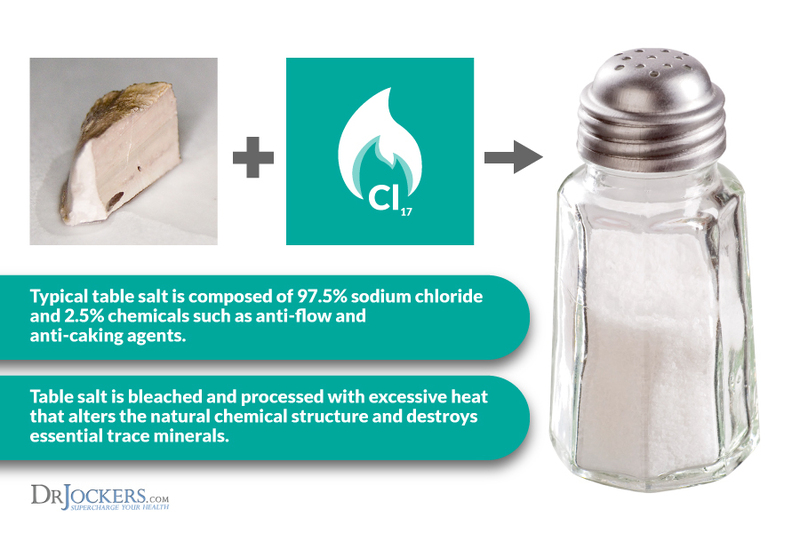 Typical table salt is composed of 97.5% sodium chloride and 2.5% chemicals such as anti-flow and anti-caking agents. Table salt is bleached and processed with excessive heat that alters the natural chemical structure and destroys essential trace minerals. Hazardous molecules such as iodine and fluoride are added along with toxic substances like aluminum hydroxide(used as an anti-moisture additive). This processing takes the “life” out of the salt making the unnatural sodium chloride and chemical fillers more challenging to metabolize. The body must sacrifice tremendous amounts of energy and up to 23 times the cell water to neutralize the damaging effects of the salt. The inability of the body to effectively neutralize these toxic substances can result in unsightly cellulite as excess water is leaks into the interstitial tissues. This also increases overall tissue pressure and can result in high blood pressure. The increases tissue pressure and toxic debris can also increase inflammation in the joints and contribute to painful conditions like rheumatoidism and gout. It also increases the risk of stone formation in the kidneys and gallbladder. Many people have turned to sea salts for their regular salt usage. Unfortunately, many of our lakes and oceans are loaded with toxic poisons like mercury, PCBs and dioxin. Oil spills can toxify a lake or ocean’s salt stores for decades after the incident. Over 85% of all sea salt producers are using a refining process for their salt production. Based on this understanding it is wise to assume that sea salt can no longer be trusted as a pure source of essential salts. 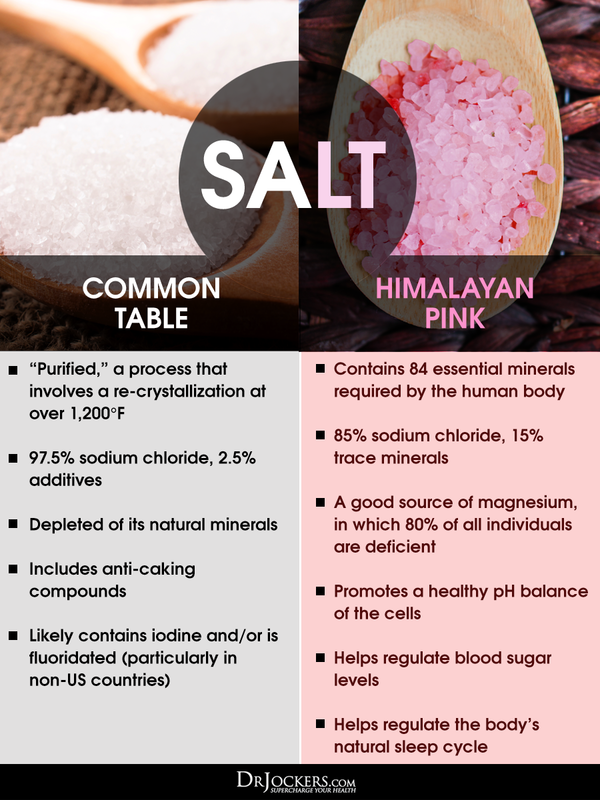 Pink salts are one of the very few varieties of salts that have remained pure and stable in nature. Natural pink salts are known for their essential trace minerals and their ability to regulate cellular fluid balance. These salts take on their color due to the presence of iron oxide and their abundance of essential trace minerals. These minerals are in a very small colloidal form and inter-connected in structure allowing for easy absorption and a nutrient synergy that exponentially enhances their effect in the body. Absorption of food particles Supports vascular & respiratory health. Promoting sinus health. Prevention of muscle cramps. Pink salts provide a great remedy for asthma (3) and allergy symptoms as well. The salts have a unique ability to unplug the thick mucus secretions in the lungs & stop overflow of nasal secretions when water is plentiful. As a natural anti-histamine, one can drink 2-3 cups of purified water with a pinch of healthy salts. These salts are powerful hygiene and detox agents that can be applied to soaps, body rubs and baths. The salts help thwart off bacteria, viruses, yeast and other opportunistic organisms. They also drive toxins out of the cells and tissues. A 2014 Vanderbilt study found that the recommended low salt intake (less than 1.5 grams per day) was associated with a significantly greater risk of heart disease. Higher ranges of sodium intake (3-6 grams daily) were associated with the lowest odds of a heart attack (4). The study authors believe that sodium had this effect because it is a potent anti-microbial that prevents infection. Chronic infections are a major risk factor for the development of heart disease. Does Sodium Support the Immune Response? Remember to listen to your body when it comes to the use of these powerhouse salts. Certain body types depend on more salts than others. If you crave salts, you are typically in need of trace minerals. Follow your instincts and use a bit more pink salt on your foods. If you have no craving for salts then only use small amounts of pink salts. Wonderful information you have provided on salt and it’s uses, it that has completely eliminated the profoundly wrong concept about salt eating due to my back ground as a conventional medical doctor. Thanks a lot again. One question in the same context, for a diabetic / heart patient / healthy person what is the safe amount of Himalayan salt that can be eaten on daily basis? I always recommend to salt up to taste preference. I believe the body will tell us when we have had enough. Individuals on a lower carbohydrate diet will need more salts than those on a moderate to higher carbohydrate diet. The more carbs in the diet, the more salt should be restricted. Hi Dr. Jockers, such an informative article. But I still have some confusions regarding pink salt i.e. how can one control blood pressure level through a salt when it is the main culprit to increase our blood pressure? Though I am using Salt Lamps from Saltean which really work great and relaxes the surrounding. You could add up to a 1/2 tsp Lynne! I usually will add a pinch to each glass of water. Thank you for the helpful article, Dr. Jockers. Do we need iodine in our diets? If so, does pink salt provide adequate amounts, or would it be wise to use liquid iodine drops? I recommend consuming wild-caught seafood and seaweed for iodine. Consume 2-3 servings per week of sea vegetable or seafood and you are good to go. You also get a lot of iodine in grass-fed animal products. Blessings! hi Doc its Pumla from S Africa, i take a spoonful of himalayan pink salt to a litre of water and drink it, will it hurt me if i do that everyday? If you do that once per day it should be fine! Hi doctor have introduced this pink salt to my aging parents who are both suffering blood pressure and diabetes.Actually it didn’t do well with them.I stopped them from using it.Now my i know what went wrong because Im using it and it’s doing well for me. I have become a fan of Himalayan salt upon reading your article. I have also heard , about SOLE in other circles; and it is generally described as water charged with salt. Would you please let me know how it is prepared at home.